Grandparents often say the best part of being a grandparent is that you get all the fun of parenting without any of the responsibility. No disciplining. No sleepless nights. No doctor appointments. You can come and go as you please, spoiling your grandchildren as much or as little as you want. But when a grandchild comes into the world and is diagnosed with a chronic health condition or a disability, all the supposed rules for grandparents are changed forever. It is often a make or break moment for a family. Sometimes, a frightened grandparent opts out of the child's life, but other times, the bewildering fear gives way to shear love, and a grandparent steps up like Julie Riera Matsushima did, and that changes everything. In her memoir, For the Love of Aimee, Matsushima recalls the birth of her first grandchildren, identical twin girls. Chloe and Aimee have matching DNA, but their lives took two different paths beginning in the womb. Aimee suffered massive brain damage before birth and the doctors speculated that she wouldn't live more than a few days. When she did, the doctors said she would never hear, see, talk, walk, or even recognize her own mother. Matsushima, who had planned to enjoy her new grandparent status from a fun but safe distance, was drawn to Aimee from the first moment she saw her. "I didn't want Aimee to be alone in the ICU," she writes, "I held her, talked to her and fed her. Something magical happened between us. We bonded and I fell in love. She amazed me every time she moved her little head. She seemed so alert, so much more aware than her prognosis seemed to imply. I observed that she appeared to respond to sounds and startled when the nurse dropped a metal container on the floor. How could she be deaf? I wondered." From that moment, despite the doctor's statement that, "Aimee… would be a quadriplegic, existing in a vegetative state all of her life," Matsushima refused to give up on her grandchild. Together, they travel the world to find a breakthrough, holding tightly onto the hope that Aimee can prove the doctors wrong and reach her full potential in a world packed with obstacles. Their determination and hard work are inspiring, uplifting and completely worth it as Aimee confronts every challenge she meets with true joy. For the Love of Aimee illustrates beautifully the affect a grandparent can have on a grandchild and an entire family when a difficult and heartbreaking diagnosis shakes them to the core. The story is inspirational, hopeful and powerful enough to change the shape of families struggling with the diagnosis of a child. Some grandparents sit on the sidelines, but amazing physical and emotional achievements can be made when fear is overcome, reality is both accepted and challenged, and a grandparent chooses to take part in a child's life. And through it all, Aimee proves to each of us that every life is worth living. 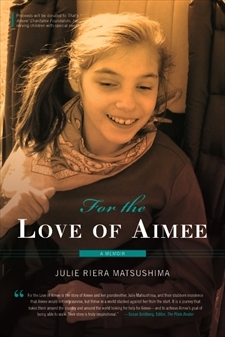 For the Love of Aimee is available at Amazon or at the book's website. All proceeds benefit the That's Amore Charitable Foundation, which serves children with special needs. You can win a copy by commenting below by 12 noon on September 30, 2011. In honor of Grandparents' Day, one comment will be chosen at random to receive a copy of For the Love of Aimee.